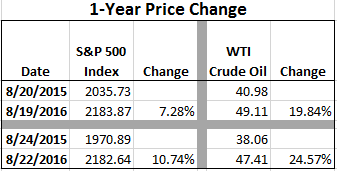 Crude oil prices spiked above $50/bbl in early June and have fallen back to $47/bbl as of Friday's close. The high $47 level remains above the early August low of $39.52. Further weakness in oil prices is likely as a result of stubbornly high crude oil inventories (excl. the Strategic Petroleum Reserve.) On Wednesday last week, the Energy Information Administration (EIA) reported weekly inventories increased 2.5 million barrels and is a reversal of the 2.5 million barrel decline in the prior weekly report. 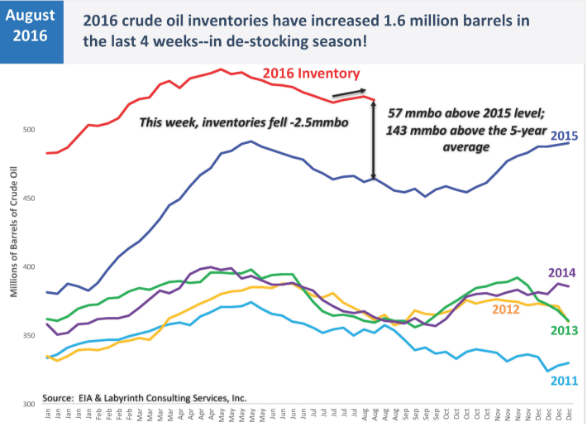 Not that one or two weekly reports tell the entire story, but, as the below chart shows, inventories remain at very elevated levels and prices are not likely to move higher until this elevated inventory is reduced. 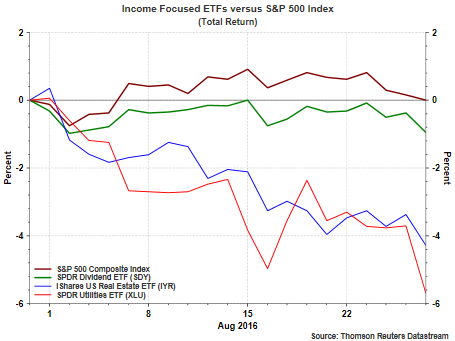 Janet Yellen's Jackson Hole comments on Friday did not do any favors for the performance of income focused investments. The Fed chairman's comments($) led market participants to believe a rate hike for September is back on the table and at least more likely in December. The rate hike fear continues to put downward pressure on income focused investments which some investors view as bond substitutes. So far in the month of August the SPDR Dividend ETF (SDY), the iShares US Real Estate ETF (IYR) and the SPDR Utilities Sector ETF (XLU) are all underperforming the broader S&P 500 Index. Also, for the month of August these three ETFs are showing negative total returns with XLU down 2% on Friday alone. The site, ETF.com, reported the utility sector ETF was among the top 10 ETFs experiencing outflows for the week, withdrawals totaling $263 million. For the better part of a month the S&P 500 Index has traded in a very narrow range. Some strategists believe the market has come too far too fast since the June low and a correction is necessary before the market moves higher. We have noted from time to time that corrections can occur in price, i.e., a decline or in time, i.e., trade sideways for an extended period. At this point in time it appears the S&P 500 Index is attempting to go through a corrective phase by trading sideways over time. Of course, the length of time required to qualify for a correction over time is unknown. I believe one key determinant for this market is earnings over the course of the next four quarters which I will discuss later in this post. 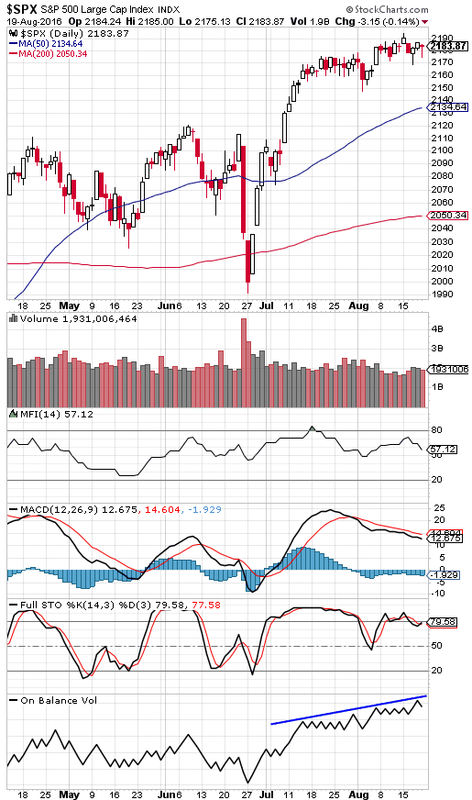 One positive indicator on the above chart is the On Balance Volume indicator. The OBV measures volume on up days and volume on down days and accumulates the data over time. It is the trend of the OBV line that is important. If the line is trending up, trading volume is higher on up days versus down days and is an indication of buying demand. 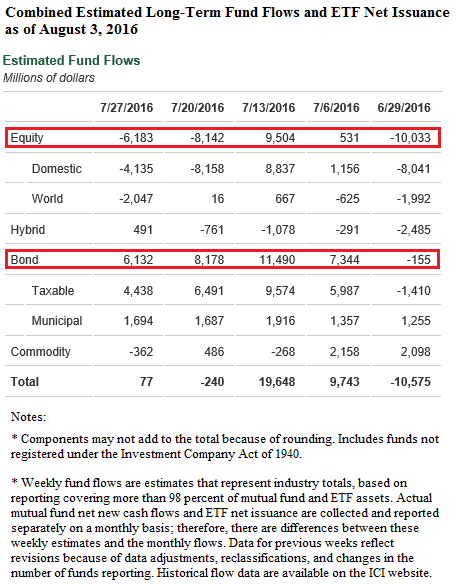 Up until this week equity fund and ETF flows were strongly negative. In Lipper's fund flow report earlier this week it is noted investors turned more favorable towards equities as equity flows turned positive with money market flows a negative $20.8 billion. 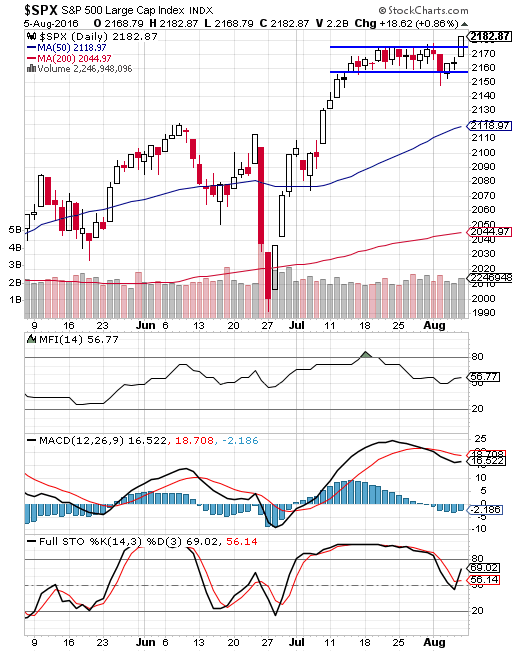 The Money Flow Index (MFI) in the above chart is a volume weighted version of the Relative Strength Index (RSI). The MFI is not at a level indicative of an over bought market and similarly, the RSI is not at an over bought level either as can be seen in the below chart. S&P Dow Jones Indices recently provided an update on the performance of the S&P 500 Dividend Aristocrats Index compared to the S&P 500 Index. It should be noted the Aristocrats index is an equally weighted index that is rebalanced quarterly. Index members are determined annually based on December year-end information with changes effective at the end of the subsequent January. I have written about the importance of dividends a number of times on this blog and this recent S&P update verifies the important role dividends play in an equity's total return. This post will provide some highlights from the S&P report and readers are encouraged to read the entire research paper. Although dividends have accounted for a smaller percentage of the the total return for the S&P 500 Index over the past several decades, dividends remain an important component due to the favorable impact dividends have on compounding. 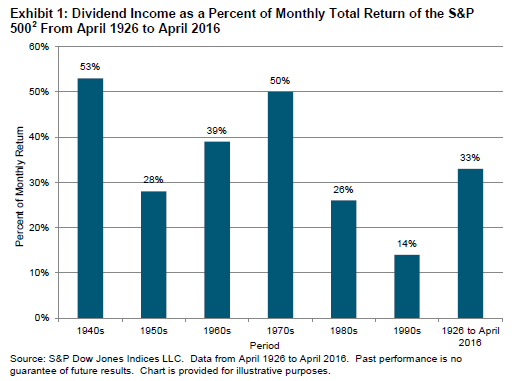 As the below chart shows, since 1929 dividends have accounted for over one-third of the return of the S&P 500 Index. From time to time I review the most active stocks by individual investors as compiled by Better Investing Magazine. I last updated the list in March and the two stocks that dropped off of the most active list from that time are Under Armor (UA) and Netflix (NFLX). The new additions are Wells Fargo (WFC) and Southwest Airlines (LUV). 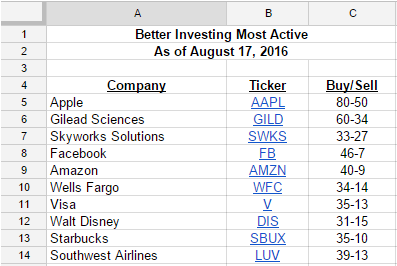 Apple (AAPL) has remained at the top of the list as far back as January 2015. Below is the most recent active list. 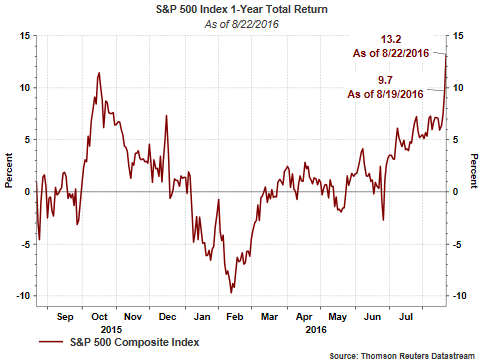 Should Investors Worry More About A Bond Or Stock Market Correction? A great deal of commentary over the past few days has focused on the recent equity market trifecta, i.e., the Dow Jones Industrial Average, the S&P 500 Index and the Nasdaq Composite Index all hit new all time highs on the same day and the heightened potential for an equity market correction. Over the past week or so, LPL Financial Research has published some good analysis around the broad index participation in new highs and potential future market outcomes. Since 1980 12-month rolling returns have been positive 76.5% of the time. 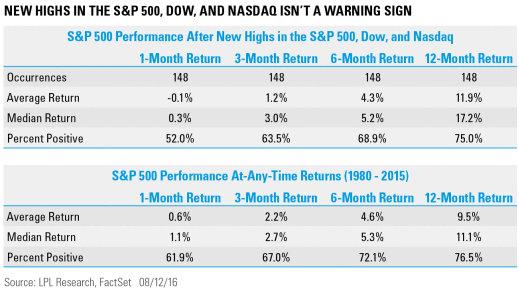 As the below table shows, when the Dow, S&P 500 and Nasdaq hit all time highs on the same day, the 12-month forward return is positive 75% of the time and averages 11.9%. I would recommend readers read the LPL article. Last Friday the S&P 500 Index closed at its daily high of 2,182.87 and this equated to a 20.6% advance since the February 11th intra-day low. In spite of this strong advance from the February low and a price only return of 6.8% this year, most investors remain bearish on stocks. This bearishness has translated into equity outflows of mutual funds and ETFs with bond investments capturing much of the inflows. The equity market's reaction to the above consensus job report today would make one believe the only missing link in the economic recovery was today's job's report. The 255,000 increase in nonfarm payrolls exceeded the consensus of 185,000 and the top range of 215,000. The end result is the S&P 500 Index was able to breakout of its sixteen day trading range. 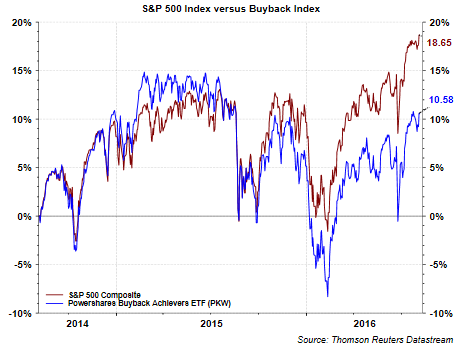 A part of the anticipated improvement in forward earnings for the S&P 500 Index is an improvement in the energy sector. The health in the energy sector has spillover into other sectors of the market like the industrial sector that sells into the energy space. Of late, however, oil prices have pulled back significantly from over $50/bbl in June and dropping below $40/bbl yesterday. 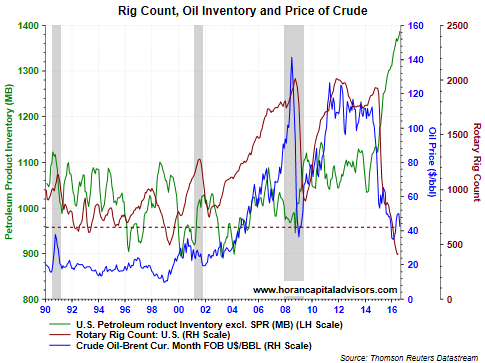 This decline in price can be directly attributable to the elevated supply of crude.